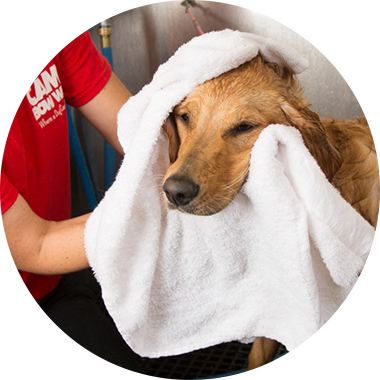 Contact us at (941) 366-2267 to learn more about our dog grooming services. Dog Weight: 1-25 lbs. Includes shampoo, paw & pad treatment, ear cleaning, brush out, & blow dry. Dogs Weight: 26-50 lbs. Includes shampoo, paw & pad treatment, ear cleaning, brush out, & blow dry. Dog Weight: 51+ lbs. Includes shampoo, paw & pad treatment, ear cleaning, brush out, & blow dry. Dog Weight: 1-25 lbs. DeShedding removes any coat that has shed from your dog's skin, including the topcoat. This does not damage or cut the coat, so it doesn't affect your dog's natural temperature regulation. Dog Weight: 26-50 lbs. DeShedding removes any coat that has shed from your dog's skin, including the topcoat. This does not damage or cut the coat, so it doesn't affect your dog's natural temperature regulation. Dog Weight: 50+ lbs. DeShedding removes any coat that has shed from your dog's skin, including the topcoat. This does not damage or cut the coat, so it doesn't affect your dog's natural temperature regulation.